While in Playa del Carmen we finally got around to doing our Open Water Scuba course. I might have a brother in the business of dive instruction but I can't wait forever to get him to teach me!! Great dive shop called Ocean Quest, it was a pretty straight-forward 3 day course - diving first in the pool learning all the drills. 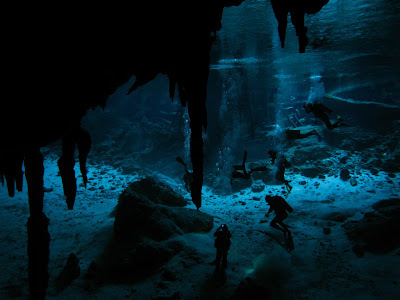 2nd day in confined water in a Cenote, then finally our 3rd day doing open water dives out in the Caribbean Sea. We'd had miserable weather - rain even on the first day but it came through for us for our boat dives - glorious weather and excellent visibility under water. Saw lots of turtles and hundreds of fish - now I'm going to HAVE to start learning to identify them and know their names (I know there was lots of Angelfish!!) I think I surprised myself how much fun diving is (I'd always worried beforehand about having to do all these drills taking off the mask underwater etc, I'd stopped realising that it was all supposed to be about having fun!! )(Chris wants me to mention at this point that of course he is a super-dude, had none of these worries having dabbled with a BSAC diving course some years ago and (I quote him)...'took to it like a fish to water' and was more concerned with where he might find the bikini clad snorkellists!) It is awesome and now we just want to dive!! We are in a pretty special part of the world right now as far as diving goes so we might blow the budget a bit here!!! The day after getting our certification we were straight in there. Booked on a 2-dive trip to one of the many Cenotes in the area - we visited 'Dos Ojos' cenote (which is '2 Eyes' in Spanish). Cenotes are unique to the Yucatan and are natural limestone sinkholes filled with fresh water. 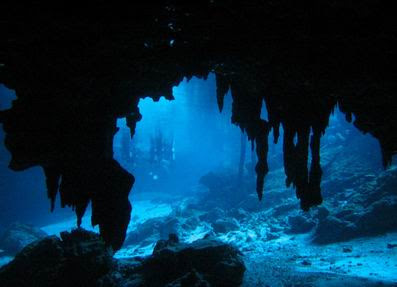 Many have spectacular stalactities and stalagmites and it's a really popular diving choice. I think we were still a bit green to appreiciate it at it's best - we spent more time worrying about 'nuetral buoyancy' and having to do this funny kick with our feet to avoid knocking the walls or kicking up silt! But it is awesome. Very dark, we had to carry flashlights, it's a maximum group of 4 per guide. There are lines to follow underwater so you don't loose your way but the cavern system goes on for miles and miles. It wasn't partiucarly deep but it was such a maze of tunnels and caverns adn really quite confined and tight in places. We surfaced in 'the bat cave' which was home to...you guessed it - bats! and we went deep enough at one point to where the fresh water mixed with salt water creating this weird swirly misty water - called a halocline apparently - weird stuff it seemed like your mask was clouded up! Such a great experience! By now we'd done 6 nights in Playa - our longest stop so far, so it really was time to get moving - not far though - just 50 miles down the road to Tulum. There's a small town on the highway but we headed for the beach area. A small road running paralell with the shore splattered with beach cabanas and mini-resorts. We had a lovely cabana in a small eco-resort - very rustic and stylish (read basic and expensive) but it was stylish too and on a gorgeous white sand beach. This really was the guidebook image - perfect white sand, turquoise waters and pretty quiet and tranquil. Our final stop in Mexico (for now!) is Mahahual. Supposedly a 'sleepy 'lil old place on the coast' there's a dirt road through one main street and lots of cabanas for rent. Recently though the cruise ships have found their way to shore here so during the day it's heaving with spring-breakers. By night it's as dead as can be! We'll be leaving tomorrow! !